Manifesto of the Communist Party, or alternatively Communist Manifesto, is one of the most important document of the communist thought which has guided since then many worker and peasant revolutions. Written in England by German philosophers Karl Marx and Friedrich Engels, who were commissioned by the Communist League, an underground international association of workers, to write a detailed political and theoretical program for the Party. 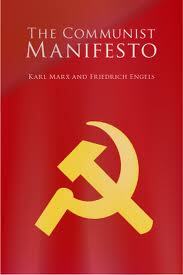 The manifesto was translated into many languages and was smuggled to many countries. In this document most of the rhetoric were characteristic of Marx; Engels contributed to main Ideas. So major was the implication of this and other works like 'The Capital' of Marx, that a branch of communism was called Marxism. Although in the preface to many editions written after the death of Marx, Engels said that this Manifesto is the work of Karl Marx, but notwithstanding his modesty, it has been since understood that Engels was a major contributor of this document. Engels provided Marx, a much-needed economic support to write his other works on communism. This book is divided into four parts. An analysis of the Class Struggle, the first part deals with the relationship between Bourgeois and Proletarians. In appendix, Bourgeois are defined as 'class of modern capitalists, owners of the means of social production and employers of wage labor.' and proletariat as the 'class of modern wage laborers who, having no means of production of their own, are reduced to selling their labor power in order to live.' It is suggested that Capitalism leads to Imperialism. When methods of production improve, there is a surplus and to find new markets for that surplus new territories are conquered. Now having more territories, the capitalist exploit working class more to increase production. The second part discusses the relationship between the proletarians and communists. It is said that communists work for the interest of working class. The difference between both of them is that Communists work for the common interests in proletarian struggles of different countries. Their only aim is to represent the interests of the movement as a whole. Main ideas of the communists were the abolition of private property, the abolition of the family, the abolition of countries and nationality, the abolition of all rights of inheritance among a host of other ideas. These were the most radical ones, radical even in contemporary society, others were largely implementable in a communist society. The third part is a critical discussion of then available socialist and communist literature. Reactionary socialism was of three types: Feudal socialism, in which aristocrats supported proletarians because they themselves were against the rise of bourgeois after the French Revolution and English reform agitation, Petty-Bourgeois Socialism, which was similar to Feudal socialism only feudal aristocracy replaced by medieval bourgeois and small peasant proprietors and German Socialism, which was the fight of Germans against feudal aristocracy and absolute monarchy. In Conservative or Bourgeois Socialism, socialist bourgeois wants all the advantages of modern social conditions without its revolutionary and disintegrating elements. Critical-Utopian Socialism and Communism were originally revolutionary ideas but now they are just a reactionary ones and aim at deadening the Class Struggle and reconciling the class antagonisms. Fourth part details the relationship of Communism with the opposition parties in European countries. The book ends with the slogan "WORKERS OF ALL COUNTRIES, UNITE!" This is a pocket-guide version of the communism theory and like all pocket-books, too many details should not be expected. It works to arouse interest in communist literature and gives a look into the propaganda when too many schools of thoughts were not developed within communism. This document was the major inspiration behind the many communist revolutions in early nineteenth century. The Communist Manifesto is recommended for those who are interested in politico-economic theories and want to know the original thoughts of Karl Marx. This part of review has gone a long way to serve as a short-cut purpose in terms of academia. Thanks for this.